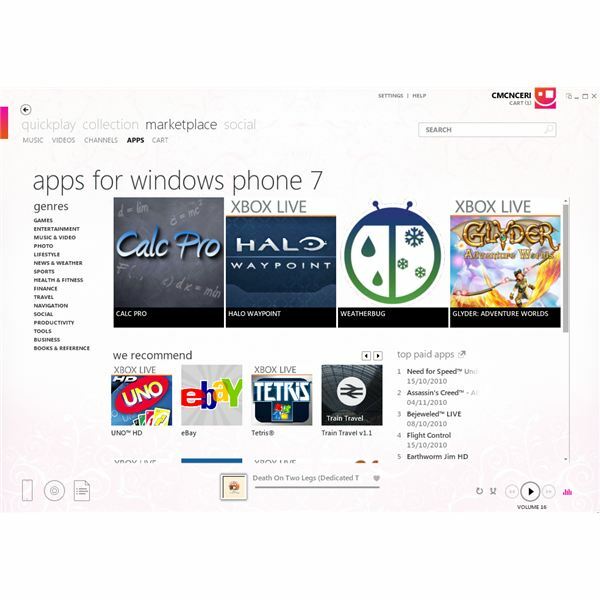 As iTunes is to iPhone, so Zune is to Windows Phone, so you can also access the Marketplace via this desktop client and install apps and games, as well as purchase and stream music and buy movies. Syncing data between your phone and computer is made as simple as possible with this software, which in most cases will detect your phone as soon as it is connected and sync content to and from your PC. However, this isn’t the case for all users. From time to time, something will get in the way of this synchronization, leading to much clenching of fists. Cases where Windows Phone 7 is not seen by the Zune desktop are not restricted to wired connections, either, as the wireless sync can also prove troublesome. There are various things that you need to check before installing Zune. Issues running the client can lead to problems syncing your phone, so make sure your computer is running Windows XP SP3, Windows Vista or Windows 7, and that it is fully specced to run one of these operating systems if you opt to upgrade. Your PC or laptop should also have a 1 GHz or faster CPU, 32-bit or 64-bit, at least 1 GB RAM for 32-bit systems or 2 GB RAM for 64-bit computers and a broadband connection. Connectivity between Windows Phone 7 and Zune is either via USB cable or your local wireless network. One of the first things you should be checking when troubleshooting syncing on WP7 is the USB cable. Make sure that you are using the same cable that shipped with the phone, and avoid connecting it to a USB hub. You might also ignore the USB panel on the front of your computer in favour of ports mounted on the back of your computer. Full details on setting up synchronization over Wi-Fi can be found in our Guide to Windows Phone 7 Wireless Sync. Problems syncing with Zune usually derive from the client not recognizing your phone. There are various things that you can do to resolve this issue. Another cause of sync issues with Windows Phone 7 comes in the shape of post-tethering misconfiguration. If you’re one of the lucky WP7 users for whom tethering is easily achieved (such as the Samsung Focus) you might have left your device setup to be detected as a networking device as opposed to a phone. This can be overcome by launching the dialler, entering the code for the secret menu (##634# on the Samsung Focus, then *#7284#) and then disabling the modem option. If your connection issue is related to wireless sync, note that there are various elements of this form of sync that do require a very specific set of circumstances. To begin, you will need to connect your device via USB cable and open Settings > Phone > Wireless Sync to check if the feature is enabled. If you have recently changed the SSID of your wireless network, this will need to be updated here. In addition, both phone and PC will need to be connected to the same domestic Wi-Fi network. Wireless sync is not supported across workplace Wi-Fi networks, according to Microsoft. Meanwhile, the phone battery needs to be at least half charged and be connected to a mains adapter rather than receiving charge through your computer. Finally, the phone should be disabled, which basically means placing it on your desk with the screen off. If you are interacting with the device, the wireless sync will not occur! Wireless syncing of your Windows Phone and your PC or laptop may also require an exception in the Windows firewall (or whatever firewall software you are using). This should happen automatically with most firewall utilities, but if it doesn’t you will have to apply a manual exception, steps for which you will find in the software documentation. If none of these options works and you are left with no other option, you should consider either a fresh install of Windows, a hard reset of your Windows Phone, or both. Should you opt to reset your phone and you are concerned about any images you have stored in it, these can be saved to your Windows Live SkyDrive via Pictures > Share > Upload to SkyDrive. A hard reset is quite a step to take, but if you feel that you have pursued every alternative you can do this via Settings > About > Reset your phone. Finally! Customize Your Windows Phone with Mango Ringtones! How Does Windows Phone Add 75,000 Users & Still Lose Marketshare?